According to the M+R 2018 Benchmarks Study, total online revenue for nonprofits grew by 23 percent in 2017. With online giving becoming increasingly essential to nonprofits’ fundraising models, every organization will need to make sure giving online is easy and fast. In my work with nonprofits, I typically see three critical yet simple tactics that can boost giving. As you read through these, feel free to email me with any questions at sarah.barnes@campbellcompany.com or weigh in below in the comments section. 1. Make giving on your website easier. Your donors expect their online experience to be quick and intuitive. Even significant financial decisions—like investment management, loan applications, and major purchases—are handled online. As many of these functionalities have come into the mainstream, the websites and apps that your donors use have become more streamlined and user-friendly—and your donation page should be too. So how do you make your online giving easier to use? The number one rule is something I like to refer to as “Two-Click Giving.” It’s simply making sure that your donors are never more than two clicks away from giving wherever they are in your digital space, whether they’re on your website, browsing one your social media pages, or reading an email. Let’s take a closer look at what this might look like. 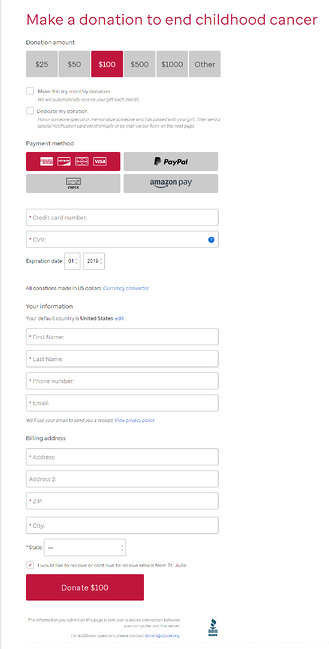 First, make sure that your donate button is above the fold on the website, in a consistent location (recommended top right), in a prominent color. Second, your donate button should have evocative text. “Donate” is boring, but “Donate Now” or “Make My Gift” incite action. A more powerful call to action reduces bounce rates (the percentage of visits in which a person leaves your website from the landing page without browsing any further) for prospective donors, leading to more gifts. 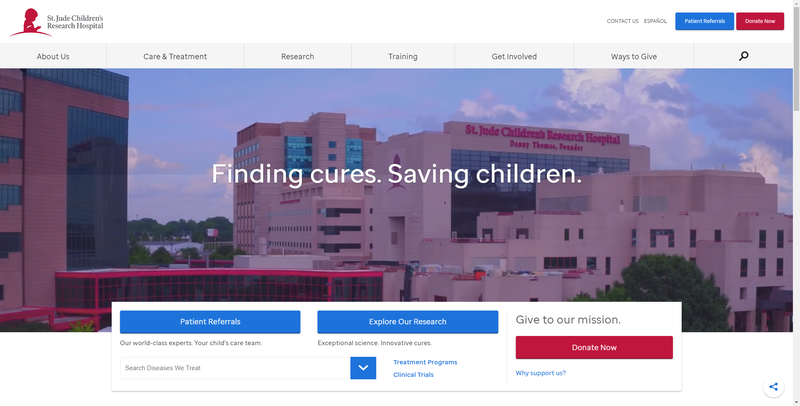 St. Jude’s Children’s Research Hospital’s website illustrates this concept well. I’ve included a screenshot below of their homepage for you to check it out. After clicking “Donate Now”, many organizations add extra steps (and clicks) before the gift is finalized. However, the M+R 2018 Benchmarks Study found that the longer a potential donor had to wait for pages to load, the more likely they were to navigate away, so using one page minimizes the amount of loading time per donation. 2. Make your fundraising emails stand out. Other than your organization’s reputation, an email subject line is the single most important factor in whether a potential donor will open your email or not. Nonprofits sent an average of 66 email messages per subscriber in 2017 (an increase of 11%), but saw open rates fall compared to 2016, according to the M+R Benchmarks Study. Your subject line will need to grab your donors’ attention right away to cut through the noise. Spend time creating a short subject line that gets your message across. According to a 2018 study by my good friends at Orbit Media, subject lines under 21 characters generated 31% higher open rates. 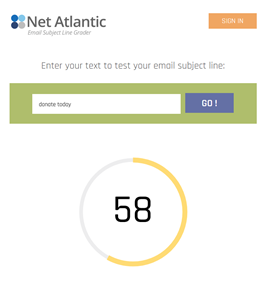 Use tools like emailsubjectlinegrader.com (pictured below) to measure how your subject line will stack up and to find ways to tweak. Above all, be human. Remember that your audience receives hundreds of emails a day, and that you have to make the case for why yours deserves their time. 3. 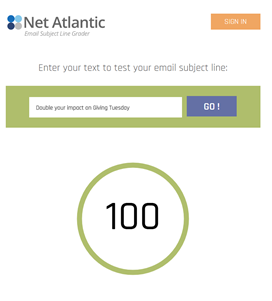 Simplify your fundraising emails. Email revenue increased by 24% in 2017 and accounted for 28% of all online giving (M+R 2018 Benchmarks Study). With percentages still out for 2018, it’s obvious that this channel is only going to become more important. Often, fundraising emails will include more than one key message—splitting the focus between multiple different subjects. I call this the “stuffing” mentality. Generally, fundraising emails are written by people who know the organization well and care about it deeply. As a result, emails are often “stuffed” with far more information than one person can process, let alone remember. So keep it simple. Ask yourself, “what is the main purpose of this email? Why is this email important? What do I want my reader to do?” An average reader will spend less than a minute reading your email, and if they haven’t grasped the main point by then, your email hasn’t done its job. If your email needs to fit multiple points, think about the hierarchy in which you present your messages. Place the most important message and call-to-action (CTA) near the top. Try using grayscale buttons for any secondary CTAs, and use white space to create a visual break and direct the reader’s attention. The above tactics are basic, but each of them can have a big impact on how your online donors choose to give. Give them a try and let me know how they go—and stay tuned for more information from our Digital Fundraising team!